How do I join? Simple! Fill in and print off the .pdf form below (sorry, we are unable to take payment via the web) and return with your remittance to the address on the form. 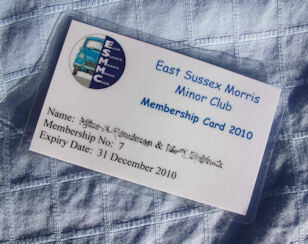 Many of our members also belong to the national MMOC, but you don't have to belong to them to join us - you don't even have to have a Morris Minor to join us - just a love of the "poached egg" car that brings a smile to so many people when you drive past! Membership runs from 1st January each year and costs just £9.00 for a single member, and £11.00 for a joint membership (2 people living at the same address). Joint membership entitles you to one copy of the club newsletter per household, but does mean that if events are oversubscribed members will be given preference over guests. All members are subject to the club rules, a written copy of which will be supplied in your membership pack. If you join on or after 1st August each year the fee is £11 for a single membership (and £13 joint) and will run until 31st December the following year. You will receive your membership pack the year you join with current membership cards for that year; your cards for the following year will then be sent out mid-February with all the new year renewals. We will endeavour to get your new member pack sent out to you as soon as possible, but please bear in mind we also have full time jobs so it may take a couple of weeks. © Copyright ESMMC 2019. All Rights Reserved.